The Vernon and District Performing Arts Centre proudly presents Mermaid Theatre’s production of Goodnight Moon and the Runaway Bunny on Sunday, November 27 at 3:00pm at the Vernon and District Performing Arts Centre. Mermaid Theatre, known in Vernon for their recent performance of The Very Hungry Caterpillar, uses picture perfect puppets to bring well-known stories to life, gently introducing young children to theatre. Goodnight Moon and the Runaway Bunny is part of the Society’s First Stages series, designed for ages two and up. Of course, children and guardians of all ages are invited to share in the magic of these beloved tales. Goodnight Moon is a celebration of familiar nighttime rituals, while The Runaway Bunny’s pretend tale of leaving home evokes reassuring responses from his loving mum. With endearing rabbit characters, and the soothing rhythms of bunny banter and dream-like imagery, both stories infuse young readers with a reassuring sense of security. Mermaid’s staged adaptation of Margaret Wise-Brown and Clement Hurd’s classics will bring a new sense of appreciation to stories that have delighted several generations. Mermaid Theatre of Nova Scotia has earned international acclaim for its unique interpretations of the works of Eric Carle (The Very Hungry Caterpillar ), Leo Lionni (Swimmy, Frederick & Inch by Inch) and Sam McBratney (Guess How Much I Love You). These widely-travelled productions incorporate innovative puppetry, striking scenic effects, and evocative original music to provide very young audiences with an effortless introduction to the performing arts and the excitement of reading. Goodnight Moon and The Runaway Bunny features these same elements. Few writers have been as attuned to the concerns and emotions of childhood as Margaret Wise Brown (1910–1952). Brown, a former teacher, believed that very young children could be fascinated by the simple pleasures of the world around them. Few had previously attempted to write specifically for children ages two to five, and Brown created some of the most enduring and beloved children’s books of all time as well as developed the concept of the first durable board book. Clement Hurd (1908–1988) graduated from Yale University and studied painting in Paris in the 1930s with Fernand Léger and others. His engaging semi-abstract style became world-famous with the publications of The Runaway Bunny in 1942, and Goodnight Moon in 1947. These collaborations with Margaret Wise Brown became two of the 20th Century’s best-known children’s books. 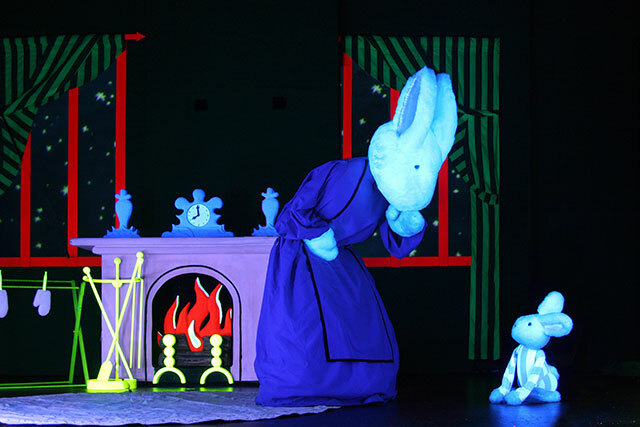 Tickets for Goodnight Moon and Runaway Bunny are $18 for all seats. Call the Ticket Seller at 250-549-SHOW (7469) or log on line to www.ticketseller.ca for tickets and more information. General audience recommended 2+. The Vernon and District Performing Arts Centre thanks the following sponsors for their generous support: TD, the Holiday Inn Express, the Vernon Morning Star, the Okanagan Advertiser, the British Columbia Arts Council, the Government of Canada and the Regional District of the North Okanagan.